Episode 58 - Jamey Bradbury Dan Sterenchuk and Tommy Estlund are honored to have as our guest, Jamey Bradbury. Jamey Bradbury is a writer who lives in Anchorage, Alaska. Her fiction has appeared in Black Warrior Review (winner of the annual fiction contest), Sou’wester, and Zone 3 and won an Estelle Campbell Memorial Award from the National Society of Arts and Letters. 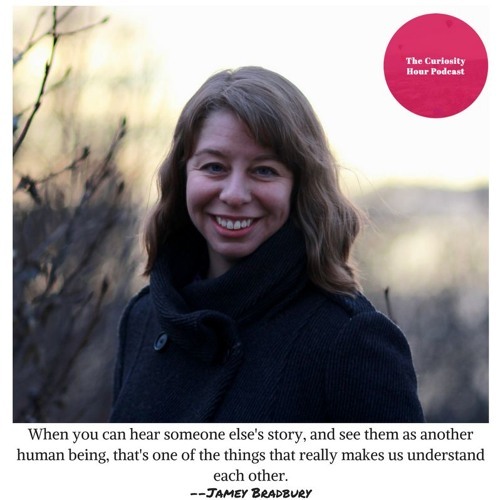 She has written nonfiction for Alaska Dispatch News, TheBillfold.com, and StorySouth. Born in Illinois, Jamey has lived in Alaska for fifteen years, leaving briefly to earn her MFA from the University of North Carolina, Greensboro, after which she worked for two years as the assistant to the novelist John Irving. She has served in the Peace Corps and now works for an Alaska Native social services agency. Her novel, The Wild Inside, is now available from HarperCollins/ William Morrow. You can learn more at www.jameybradbury.com. Note: guests create their own bio description for each episode. The Curiosity Hour Podcast is hosted and produced by Dan Sterenchuk and Tommy Estlund. Please visit our website for more information: thecuriosityhourpodcast.com Please visit this page for information where you can listen to our podcast: thecuriosityhourpodcast.com/listen/ If you would like to share your story or have a suggested guest, please complete the "Contact us" form: thecuriosityhourpodcast.com/contact-us/ Disclaimers: The Curiosity Hour Podcast may contain content not suitable for all audiences. Listener discretion advised. The views and opinions expressed by the guests on this podcast are solely those of the guest(s). These views and opinions do not necessarily represent those of The Curiosity Hour Podcast. This podcast may contain explicit language.